I read in the paper this morning that Nick Reynolds (on the right in the photo), founding member of the Kingston Trio, died Wednesday in San Diego at the age of 75. His obituary in the Los Angeles Times can be found here, but I also encourage readers to take a look at my earlier blog entry on former Kingston Trio member John Stewart (at left in the photo), who died this past February, that can be found here. I was prompted to post the earlier blog because some years ago Becky and I published a short piece on the Kingston Trio in The Guide to U. S. Popular Culture (Bowling Green State University Popular Press), and because I've always thought they were a fine folk group. With the death of Nick Reynolds, the sole surviving member of the original Kingston Trio is now Bob Shane (center). 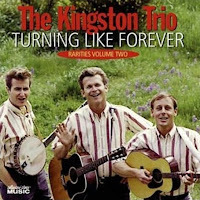 I reproduced our short article on the Kingston Trio on the earlier blog. The Kingston Trio's massive hit, "Tom Dooley," of course, prompted the so-called "folk revival" of the late 1950s, inspiring numerous folk musicians, among the most famous being Bob Dylan and Peter, Paul and Mary; ironically, the Kingston Trio initially considered itself a calypso group, naming itself after the capital of Jamaica. The group's first several records did extremely well, and in general their records sold well up to the year 1964--that is, the annus mirabilis of the Beatles. Founding member Dave Guard (who died in 1991) left early in the 1960s, replaced by John Stewart; Nick Reynolds finally left in 1967, the end of line for the original band. Still, the commercial viability of the band lasted many years, making them one of the more successful folk groups of all time.